The Iraqi Festival is a spectacular showcase of our diversity of music, arts, and cultures. Multi-generational and multi-cultural families gather to enjoy live music, arts and crafts, entertainment, children’s activities, and services from local & national businesses, food, and vendors. 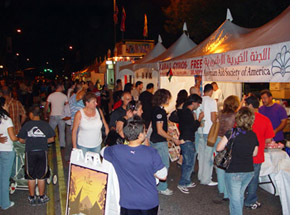 The Iraqi Festival will be a great opportunity to showcase your products and/or services to a large captivated audience. As a Vendor you can expect thousands of potential customers in attendance and you can promote your company, products and services to a concentrated target audience. This is a unique event and may be the only Iraqi event of this magnitude anywhere. We are a registered 501(c)(3) non-profit organization and is classified as a public charity under the U.S. Internal Revenue Code. all fees are 100% tax deductible.